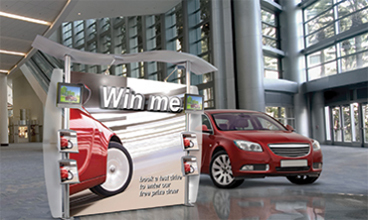 When looking for an ideal exhibition stand, you want something easy to transport, simple to set up and exciting to look at. Our pop-up systems are easy to assemble and and the hardware is a high quality aluminium construction. Pop Up systems are easy to transport and set up, just unpack, fold out the frame, click on the magnetic bars and hang the graphics. The panels are mounted onto the system by means of magnetic strips down each edge and this ensures a seamless blend from one panel to the next. Available in a range of different specifications including straight or curved systems, accessories such as halogen spotlights and podium graphics can add to the overall effect. The graphics for exhibition systems are printed onto a strong, flexible material that is 100% opaque, this ensures that there is no show through even under the harshest lighting conditions. If needed, frames can be tailor made to fit an exact area. Kit price includes cross-braced frame plus frame bag, magnetic bars plus bag and a wheeled transport case.